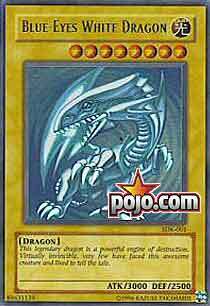 We open off the week with Blue Eyes White Dragon, truly a classic. With 3000 ATK and 2500 DEF, it’s powerful; but of course, it’s a Normal Monster that requires two tributes to summon. There are some support cards for BEWD though – Paladin of White Dragon summons him more quickly (though you might as well just keep Paladin), Kaibaman also summons him more quickly, and Burst Stream of Destruction kills stuff, which is always rentsy. Should you run him in your deck? No. Should you run him in a Dragon Deck? No. Should you run him in a deck tailored specifically for Blue Eyes White Dragon? You betcha. It seems there really is no clear cut cookie cutter right now, something great for the game but bad for my reviews. The successful decks seem to be combinations of hand control and field control, so I’ll just play it safe and call it Control, I guess. Today we're looking at an old fan favorite, the almighty BEWD. I remember when this card actually saw play, and also remember when people would use some of the (few) support cards to help get him out. I'm not going to beat around the bush; we're not going to see BEWD in any Shonen Jummp decks anytime soon. Yes, today we look at the might Blue Eyes White Dragon. I'll keep this review short and sweet. BEWD is a two trib normal Level 8 monster with stats of 3000 attack and 2500 defense. It combos well with Lord of D. and the Flute of Summoning Dragon of course, and Cost Down would make Blue Eyes only one tribute. Even if you need the heavy hitter in a Dragon deck, try a Tyrant Dragon instead, which is better, in my humble opinion. Coin Flip If you are reading this, Jonnyo has probably updated my CotD's. I think it is becoming tradition for me to turn in CotD's at the end of the week and not the beginning. The fact that next week's cards haven't been chosen yet doesn't help. Anyway, if you want to read any of them, Tuesday is rather good and offers an interesting rating, and Thursday is brief enough that you could have finished it twice in the amount of time it took you to read this little aside. Perhaps thrice by now. I wouldn't particularly recommend reading any of the others, although if you enjoy my abortions of wit and intellect, you will want to give them a read. The task of reviewing such powerful and combolicious cards has sucked my prose and linguistic skills dry. And I consider myself quite the cunning linguist. Tuesday is probably the best this week. I think I'll take today to make a joke review. Have you noticed that this game is racist? Blue-Eyes White Arya- er, Dragon is far more powerful than Red-Eyes BLACK Dragon, and the DARK Magician can't hold a candle to BEWD until a white chick helps him. Oh, and Magical Scientist is Hitler. Don't play this card. That's what the neo-Nazi bastards want you to do. Instead, play the beautiful and exotic* Amazonesses, or the Silent Swordsmen or Magicians. The mute and blue-skinned are quite well-represented in this game. For the real review, this card is horrible unless you've already top 8'd and decide to side this in for fun, or you're building a BEWD-themed deck. Sad how I can joke around for a greater length of time than I can give an insightful review of a card's potential.